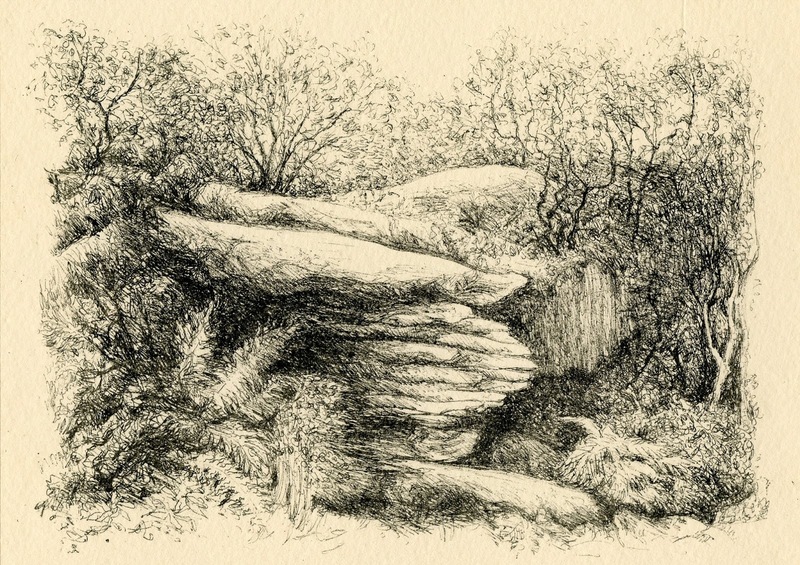 Anyone who has visited Brimham Rocks near Summerbridge, North Yorkshire, England, cannot but marvel at their sheer variety of form. Softened in places by the overgrowth of trees and ferns, in other places they stand out more starkly from the ground. I call this one the Pot Belly rock. Both lithographs were printed on Somerset paper. Some of the rocks are balanced and/or piled up one on another. 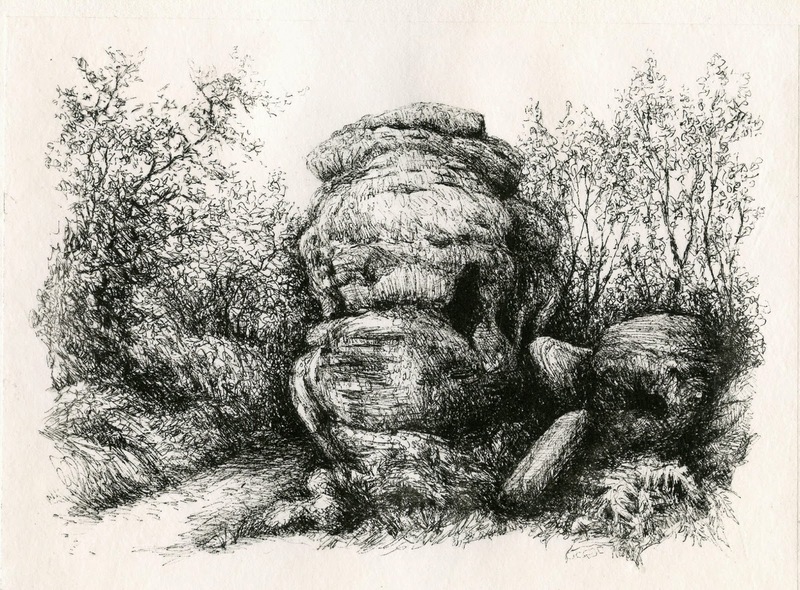 All are of millstone grit eroded over time by water, glaciation and wind. 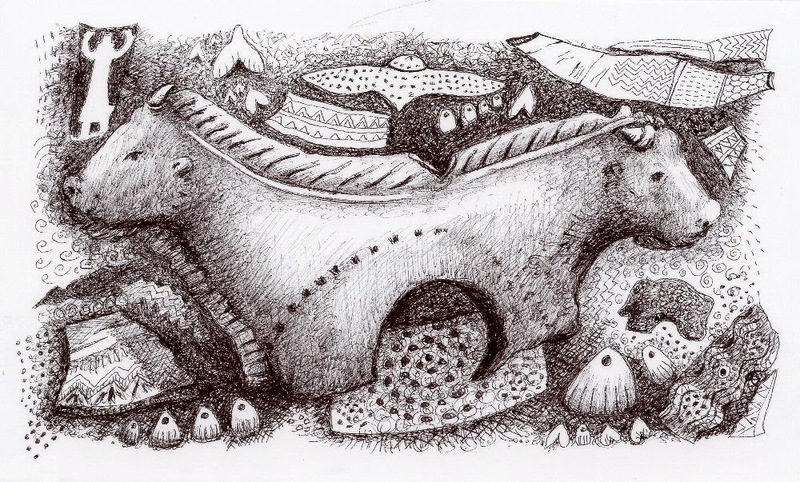 This drawing in ball point pen on a polyester litho plate was made from motifs drawn in my sketchbook at the Ice Age Art exhibition at the British Museum in 2013. The male and female bison were carved from an antler.The tiny man carved in relief, with raised arms had a caption suggesting he was singing, dancing or praying. The other objects, beads, the owl in flight and patterned ivories are made from mammoth ivory. I felt so privileged to come face to face with objects made twenty or thirty thousand years ago. Another sculpted antler baton that interested me was of a fish that had swallowed a salmon. Again I was amazed not so much that these ancient cultures knew about food chains but that they committed their observations so beautifully into carved objects. Using my sketch as a starting point I made this lithograph, adding a fin and the fish predating tiny fish and just a suggestion of pond life in the water. To add solidity to the fish/bird body origami paper was used for the chine colle.